Apart from eyeshadow palettes I love nothing more than a good lipstick and there's many budget brands out there that deliver in terms of quality and pigmentation at a really affordable price. Freedom Makeup being one of them so, I was excited to receive 5 of those lipsticks and later purchase another 2. I was sent the Pro Pink Lipstick Collection which is buy 4 get 1 free - and at a pound each that's not bad at all. Bottom to top - Candy Sweet, Wildflower, Pink Lust, Flushed & Tell Your Friends. Candy Sweet is a gorgeous, fuchsia pink; bright and bold - a real statement lipstick. And probably my favourite of the collection. 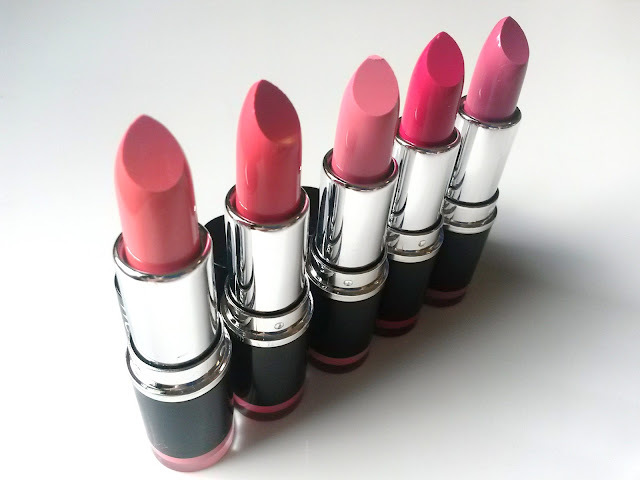 This is a perfect Summer lipstick that will suit most skin tones, especially lighter skin tones. Wildflower is a real Barbie pink with a slight purple tone to it. I don't tend to get on with shades like this, but I actually really like this one and I think it'll be a nice holiday lipstick for wearing during the day. Pink Lust is one for packing in your holiday makeup bag to. My swatches don't do it any justice at all, but it's a real flamingo pink shade. It's literally the most perfect, Summer shade. Flushed and Tell Your Friends are shades I liked the least from the pink collection. Flushed wasn't opaque like I hoped it would be and needed to be built up due to how patchy it looked on my lips, and this wasn't because I have dry lips it's just how the lipstick applied. It's one of the paler lipsticks from the collection and even my love of pink can't get me to like this lipstick. Lipsticks this light don't work on my pale skin tone and make me look washed out. Tell Your Friends applies much better, but again, it's quite a pale lipstick and does nothing for me, unfortunately. L-R Whispers & Born with it. Whispers is from the Pro Bare range. It's a slightly warmer tone in the swatch, but definitely has a coral/orange tone to it, however, it shows up as a 'better than lips' lip colour. It's nice enough and will be good for those who want a more minimal makeup look. Born with it is such a pretty shade. It's from the Pro Red range. It's a very understated red and a go-to shade if you want a pop of colour without going all out with a bold, statement red. I'm really impressed with the majority of the shades, for a pound I feel these offer more than your moneys worth and give great pigmentation and a fab finish. The formula of all the above is creamy and last a couple of hours before top-ups are needed. All the shades are available for £1 each here. This post contains PR Sample. lovely selection ! I didn't know that brand but it look good . These are really stunning shades, I've recently been experimenting with pink lips so I'll have to check them out! I love those shades of rosé and pink, perfect colours for summer!